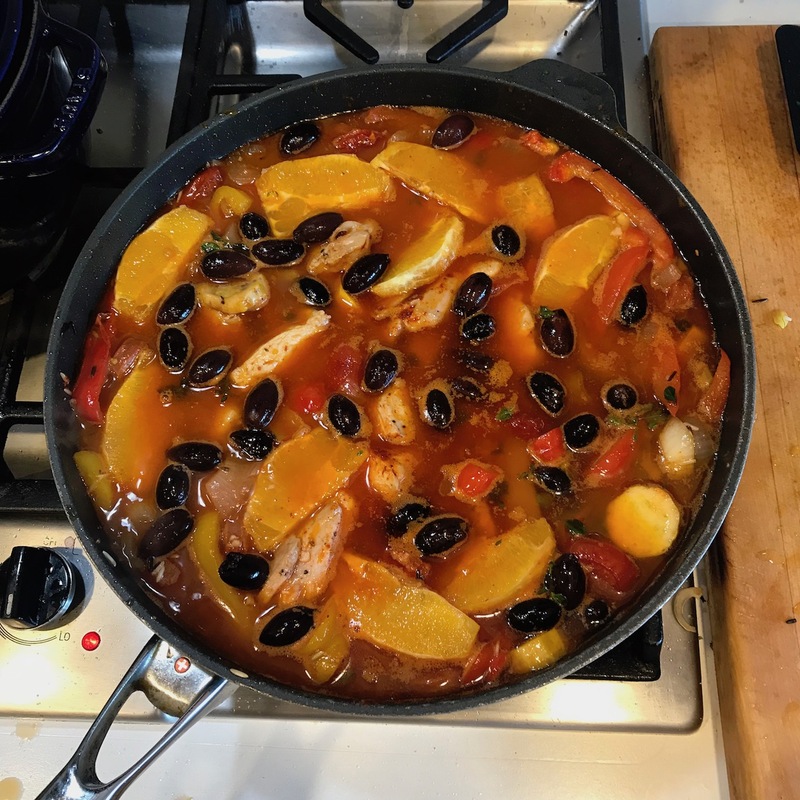 This is the Spanish (Basque) one-pot-meal equivalent to Hunter's Chicken Stew (Pollo Cattictore or Coq au vin). Start by seasoning the chicken pieces well with salt and pepper. Next, slice the bell peppers in half and remove the seeds and pith, then slice each half into 1/4 inch strips. Likewise, peel the onion and slice into strips of approximately the same size. The dried tomatoes should be drained, and then cut into ½ inch (1 cm) pieces. Then heat 2 tablespoons olive oil in the casserole and, when it is fairly hot, add the chicken pieces – two or three at a time – and brown them on both sides. As they brown remove them to a plate, using a draining spoon. Next add a little more oil to the casserole, with the heat slightly higher than medium. As soon as the oil is hot, add the onion. tomatoes and peppers and allow them to brown a little at the edges, moving them around from time to time, for about 5 minutes. After that, add the chorizo, sun-dried tomatoes and garlic and toss these around for a minute or two until the garlic is pale golden and the chorizo has taken on some colour. Next, stir in the rice and, when the grains have a good coating of oil, add the espellete pepper or paprika, and chopped thyme. Pour in the stock and wine, and add some seasoning. As soon as everything has reached the simmering point, turn the heat down to a gentle simmer. Add a little more seasoning, then place the chicken gently on top of everything (it's important to keep the rice down in the liquid). Finally, place the pieces of orange among the chicken and scatter with the olives. Cover and cook at a gentle simmer for about 50 minutes to an hour or until the rice is cooked but still retains a little bite. Alternatively cook in a preheated oven at 350°F (180°C), for 1 hour.